You'll look forward to leftovers when you use them to make this easy and delicious Cobb salad loaded with turkey, bacon, carrots, egg, avocado, and tomato. The best part about a Cobb is that it's so customizable; just about anything goes, so feel free to mix and match your favorite ingredients of whatever you happen to have available. 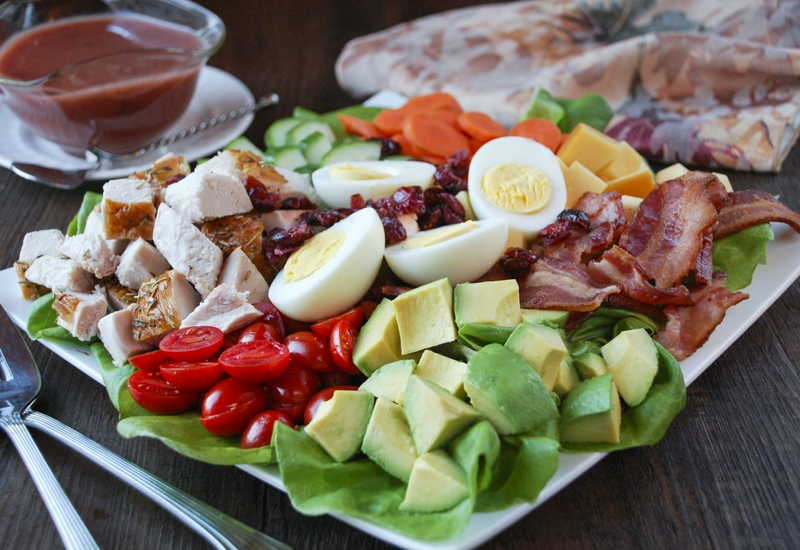 Use leftover chicken instead of turkey for a lovely chicken cobb salad! Per Serving: 765 calories; 39g fat; 71.5g carbohydrates; 38g protein; 209mg cholesterol; 661mg sodium. such a great salad, all the best toppings, YUM! I love Cobb salads, and this version using turkey was really good. I skipped the cranberry dressing and went with a different style vinaigrette. Overall I loved it! I made this Cobb salad using turkey and chicken! The best of both worlds. I also skipped the dressing and used my own. I think I'll always want to make this salad with turkey now, it was so good. Best turkey cobb salad ever! I added extra bacon and egg! You can never really have too much of either. I had so much leftover turkey, this was such a great way to re-use the meat and not be wasteful. Oh, and I used spinach instead of bibb lettuce. This is the best salad, even for people that claim they "don't like salad". My husband is not much of a salad guy, but he ate the entire plate, and had room for seconds. Of course he hogged most of the turkey, but that's ok, I was just glad I finally got him to eat something healthy. We didn't do the cranberry sauce dressing, we used ranch. Other than that, made no changes and loved every bite.